Researchers from over ten institutions have combined forces to create the largest ever tree of life. The searchable database contains over 2.3 million species and keeps growing. The internet is hosting a pretty big family reunion right now. Everybody's there - cousins you forgot about, weird uncles, a giant sea scorpion. Animals, fungi, plants; bacteria, archaea, eukaryotes. 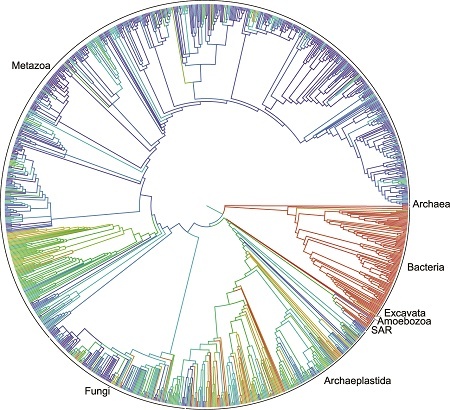 This is all life on Earth, by way of Open Tree of Life. OToF is a semi-open source project brought to us by scientists from nearly a dozen institutions. In simple terms, it's all 3.5 billion years of life, plus search engine. Over two million species, extinct and extant, are represented, with more being added regularly by anyone who can contribute. And it's very hypnotizing. I've been playing a game with it, like the classic Wikipedia challenge - wherein you start at a random page, and try to get to a pre-determined result, such as "Kevin Bacon," or "Canada." With OpenTreeofLife, I started off trying to find humans - good old homo sapiens - and I was bad at it. You can cheat, of course - there's that search bar at the top of the page. But I challenge readers to think of a living thing - anything, be it animal, vegetable, or bacterial (if you know any particular bacteria), and try to find it, clicking on circles that represent classes and phylums. A few hints, if you're trying for humans: you've got to start with eukaryotes, for starters. That's the cells with other cells in 'em. From there you'll look for metazoa, aka animals. Mostly, keep following the biggest circles - those represent paths with the most descendants. It's practically clear sailing once you've found chordata - just take a hard left when you see some amphibians and follow the monkeys. If you get bats, you've gone too far, but you were on the right track. Strangely, homo sapiens is all by its lonesome, flanked by chimps and gorillas. Related hominid species such as homo erectus are still "Incertae Sedis" - we know roughly where they belong, but we don't want to slot them in until we're sure of it. Alright, guys. Anyone else having fun with this? And has anyone seen Kevin Bacon? I got myself excited by this only to get myself disappointed that every jpeg of it I've seen was too small to read every branch. Now to look for that endoskeleton branch!.... Assuming that's just one branch with lots of branches. Now if only I knew what I was looking at... Wonderful, but severely out of my nerd depth.